The Dubai Gold and Commodities Exchange (DGCX) have been named, for the second consecutive year, ‘Exchange of the Year’ at the prestigious Global Investor MENA Awards 2018. The award recognised DGCX’s exceptional performance over the last 12 months, which saw it record new all-time trading highs, launch innovative products, services and initiatives, as well as implementing cutting-edge technology to better serve the needs of its clients. 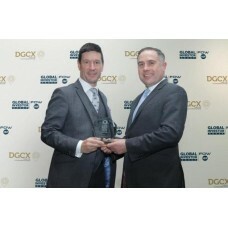 DGCX beat stiff competition from the region’s leading exchanges to win the award. In the qualifying period, the Exchange traded over 19.3 million contracts, setting a new overall volume record, with a notional value exceeding USD 441 billion. “Coinciding with this achievement, we are delighted to announce that DGCX broke its all-time annual volumes record in November. This is a huge milestone for us and indicates that our efforts to add more depth to the marketplace and meet investment and hedging needs have been successful. We remain extremely upbeat as we approach the end of the year, and we look forward to delivering further excellence, innovation and most importantly confidence to our investors and traders,” Male added.